EL CAJON (4-9-2019) – Granite Hills High maintained a two-horse race in the Grossmont Hills League, galloping to an early lead to put away Grossmont, 9-4, in Monday’s (Apr. 8) decision which left the Eagles and Santana tied for the top spot headed into Wednesday’s head-to-head tiebreaker for the inside path to the league pennant. Three runs in the 1st, 3rd and 4th innings catapulted Granite Hills to a 9-1 lead, as a 15-hit attack made life easy for Eagles pitchers Catie Dobbs and Staci Chambers. Dobbs registered seven strikeouts, on the Hillers, but when she was tagged for three runs in the 5th to allow a slim window of opportunity, Chambers entered to retire sic of seven batters, with one player reaching on a meaningless 2-out error in the 7th. Granite Hills (14-7 overall, 4-0 GHL) now owns a 12-game winning streak in its series with Grossmont ( (11-7, 2-2 GHL). After Dobbs survived a shaky start by walking three batters without allowing a run in the 1st, the Eagles quickly countered by plating their trio across for a 3-o advantage. A leadoff double by Bailey Wallace was followed by four consecutive singles — from Rylee Omahen (3 RBI), Chambers, Amaya Esparza and Haley Johnson — made it 2-0. An out later, Brooke Bertussi walked to force in another run. 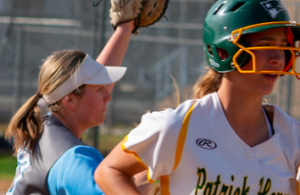 By contrast, it took all seven innings for Grossmont to post four hits against the Dobbs-Chambers tandem in the circle, capped y a bases-loaded clearing double by Jessica Medlin in the 5th. For Medlin, the red-hot catcher owns 11 RBI in April alone. However, the Eagles already held an 8-run cushion, featuring a pairs 2-run singles, one by Morgan Kelly in the 3rd, then another by Johnson in the 4th. For Granite Hills, Esparza batted 3-for-4 with a pair of doubles. Grossmont’s only other run saw first baseman Kati Contreras stroke a solo home run in the 3rd. The homer was her sixth of the season, move Contreras just one behind Chambers, the East County and CIF San Diego Section leader with seven. LIBERTY CHARTER 12, CV-CALVARY CHRISTIAN 3: At Chula Vista, the Lions of Lemon Grove snapped a 4-game losing skid by pounding the Purple Knights. Liberty Charter now joins SD-High Tech for the most non-league wins among Summit League programs. The league schedule starts Apr. 18 on the road against Bayfront Charter. Already leading 4-2, the improving Lions tallied four times in the 4th to pull away for their second all-time victory over Calvary Christian following five career setbacks to start the series. The big stick belongs to shortstop Faith Via. who stroked a 3-run home run and a double in a 4-for-4 outing. Via drove in five runs and scored four times. Via’s long-ball to right field, which also scored, Sarah Johnston Lily Schallock (both singled) was answered by Lions center fielder Katie Peet. The cleanup hitter made it back-to-back home runs for a 7-2 advantage in the 4th. Peet and Jayden Ortiz both batted 3-for-5, while left fielder Sophie Schallock added two hits and crossed the plate twice. Calvary Christian (2-3) saw freshman A.J. Farfan, the team captain, bat 3-for-4 with a homer, collecting two RBI and scoring twice. The Purple Knights were coming off their one wins of the season, a doubleheader sweep of Borrego Springs. 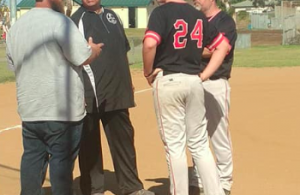 FOOTHILLS CHRISTIAN 12, GUAJOME PARK 1: At Brengle Terrace Park in Vista, the Knights forged a 3-way tie at the top of the Pacific League by filleting the Frogs. Carissa Wolford led the way on both sides of home plate. As the leadoff batter, she went 2-for-3 and scored three times. In the pitching circle, Wolford gained the victory after striking out rule shortened contest. Out of the bullpen, Carissa Wolford earned the save with a pair of no-hit innings. Wolford’s runs mostly came off the bat of shortstop Carly Robbins. The freshman went 2-for-2 and drove in three runs, giving her an East County-leading 20 RBI for the season for Foothills Christian (6-2 overall, 3-1 PL). Guajome Park (1-5, 0-1 PL) went 20-7 last season and is the defending CIFSDS Division V runner-up to Liberty Charter. MOUNTAIN EMPIRE 23, VINCENT MEMORIAL 7: At Campo, the unbeaten RedHawks (5-0 stopped the winless Scots (0-3) of Calexico in Monday’s (Apr. 8) Manzanita League contest. Calipatria leads the league at 3-0, with Mountain Empire second, a half-game above Borrego Springs. 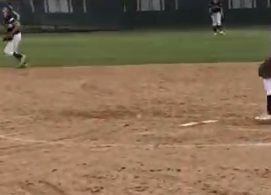 MONTE VISTA 16, LA JOLLA 1: At Spring Valley, Dessire Corona and Ionna Upham paired to fire a 2-hitter as the mighty Monarchs won over the vile Vikings in non-league action on Monday (Apr. 8). Both players also delivered extra-base hits. For Monte Vista (10-7), Upham delivered a 3-run triple when the hosts tallied 11 times in the 3rd. Meanwhile. Sophia Bodtke came off the bench to collect 2 RBI, and Meeah Matanane stroked a pair of doubles, sending La Jolla to their 11th straight loss without a win this season. PATRICK HENRY 9, WEST HILLS 0: At Santee, Patriots pitcher Hailey Jenks posted just the ballclub’s second shutout of the season in handing the Wolf Pack their eighth straight setback in run-rule fashion. Jenks struck out eight in finishing her complete-game 1-hitter. The lone base hit was by West Hills’ Alyssa Borbolla, who doubled to open the 4th. Kaiah Altmeyer and Olivia Giganti collected two RBI each, while Dez Patmon added a pair of doubles. SANTANA 8, CLAIREMONT 7 – Madison Mendez hit a pair of solo home runs and Santana (9-4) rallied from a 6-2 deficit for the victory. Mendez now has five home runs this season. Lakaila Aquiningoc-David singled home Mendez and Hailey Justice has a game-tying double. Pinch-hitter Shelby Holmquist drove in a pair of runs for an 8-6 lead. For the Sultans, Joey Barkhimer earned the win with 5 2/3 innings of work.